Photo by UN Climate Change. The recent United Nations climate change conference in Durban — described by the New York Times newspaper as “the 17th in a series of habitually quarrelsome and mostly unproductive gatherings since the same countries met in 1992 in Rio de Janeiro” — predictably did not achieve many results. One important part of this year’s conference was the the Green Climate Fund that was agreed to at the Copenhagen summit in 2009, and which is intended to provide US$100 billion a year in public and private financing by 2020 to assist the world’s poorest countries in mitigating and adapting to the environmental threats posed by climate change. 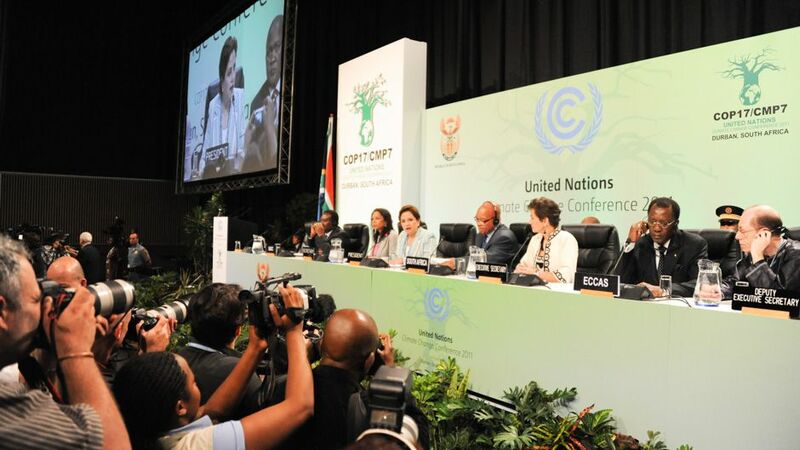 Although there are still a number of important unresolved issues including its legal status and relationship to the UN Framework Convention on Climate Change (UNFCCC), decisions taken on the fund in Durban could be seen as a hopeful step forward. Of course, this is not the first time a UN sponsored international environmental conference ended with promises of future money and technology for the developing world. More than two decades ago in 1989, the UN General Assembly declared the importance of identifying “ways and means of providing new and additional financial resources, particularly to developing countries, for environmentally sound development programmes”. Three years later, the UN estimated the overall cost of implementing the ensuing Agenda 21 plan in the developing world was to have been around “$600 billion, including about $125 billion on grant or concessional terms from the international community”. It is unclear how much of the promised $600 billion has been transferred to the developing world but it is worth noting that the UN request to the wealthy Organization for Economic Cooperation and Development (OECD) countries to contribute 0.7 percent of GDP to development assistance has been consistently ignored. Sadly, compared to past international environmental conferences, the chances of raising the necessary and promised Green Climate Fund money are severely constrained by the rapidly deteriorating geo-political context in which the usual sustainability leaders like the European Union (EU) that champion big global initiatives like Agenda 21 and can be counted upon to lobby the typically reluctant United States are being severely hobbled by their own persistent domestic and regional problems. The entire question of whether the EU will continue in its current form is starting to be asked by a number of observers — an unthinkable scenario as recently as a couple of months ago. While it is hard to be optimistic about the future of the UNFCCC, the Green Climate Fund can be a real opportunity to move forward on global climate governance and bring real economic and technological dividends to the developing world. Four critical issues and questions will determine whether this opportunity will be realized. First, can the Green Climate Fund help the most vulnerable population in the developing world adapt and help manage the diverse risks associated with climate change? Whereas there are more than two dozen developing countries with economies that are expanding rapidly enough to reduce poverty quickly, thirty-five developing countries with a combined population of nearly a billion people (or what the Oxford economist Paul Collier refers to as the “bottom billion” are consistently lumped together at the bottom of the annual United Nations Human Development Report country index. Second, can the Green Climate Fund be designed organizationally to reconcile the competing interests of the Fund’s many interest groups and stakeholders? Whenever billions in scarce investment capital is at stake there will be no shortage of stakeholders trying to shape the terrain of what constitutes the Fund’s “success”. The Washington D.C.-based policy think tank, the Center for American Progress, has argued that the management of the Fund will need to have “independence from the UNFCCC bureaucracy to make the most cost-effective funding decisions” and need to be “performance-based and data-driven”. While these are important recommendations, the more relevant question is how precisely to make that so? Should the Fund operate more like a typical investment fund with professional managers and analysts? There is no doubt that some donor countries would prefer that model while many other countries, particularly those in the developing world, would see this as evidence that the wealthier countries (who will have to take the lead in providing the necessary investment capital) are more interested in placing unreasonable if not unnecessary conditions on fund disbursement. In the case of the US, any tight linkages between the Green Climate Fund and UN bureaucracy will make it that much harder to mobilize the necessary domestic political support to financially support the Fund. Though similar anti-UN sentiments exist in the EU, it is nowhere as strong as in the US. The third question is: can the Green Climate Fund create the necessary enabling environment for the private sector to invest in local climate solutions in the developing world? The biggest change in global climate governance in the past two decades may arguably be the shift in perspective from opposing to engaging the private sector in creating grassroots local climate solutions. While we should continue to have debates on the legitimacy of something like the Keystone pipeline project, there is no question that some form of private sector financing will be needed to complement the existing national development assistance programmes as well as international environmental financial mechanisms like the Global Environment Facility. In a recent working paper, Katherine Sierra, a Senior Fellow on Global Economy and Development at the Brookings Institution and former Vice-President of Sustainable Development at the World Bank, highlights the importance of using public funds to help transform the market conditions for private investments and to identify innovative mechanisms to attract private sector investors in climate change projects in the developing world. For instance, public funds can be used to reduce the overall cost of deploying clean technologies in the developing world and to lower the transaction costs to attract greater private capital to green infrastructure projects. So the question is no longer if but how the private sector can be engaged as investors and partners in realizing the broader goals of the Green Climate Fund. The fourth matter to consider is how effectively the Fund will be managed in terms of institutional transparency, accountability and impact. Since 1960, wealthier countries in Western Europe, and North America and Japan have given out US$3.2 trillion in Official Development Assistance (ODA). ODA is now a $200 billion industry with $122 billion coming from the traditional wealthy OECD countries; $53 billion to $75 billion coming from private donors (e.g., foundations and private companies) and $14 billion annually coming from emerging economy donors including China, India, Brazil, Turkey and the Republic of Korea, among others. The greatest challenge confronting the ODA today with important implications for the Green Climate Fund is to make sure that both donor countries and the recipient countries live up to their responsibilities. Donor countries or institutions have to live up to certain standards of transparency while recipient countries or institutions need to be held to certain benchmarks of accountability. According to one recent report by the International Institute for Environment and Development — which provides a scorecard of which countries are leaders or laggards in terms of providing new and additional funding as part of the 2010–12 “fast-start climate finance” program agreed upon in Copenhagen — even the highest ranked countries (Japan and Norway) need to go much further in terms of climate finance transparency. In its most recent annual report Transparency International also highlighted transparency and institutional corruption as critically important factors in climate change governance. Whether the Green Climate Fund eventually has the capacity to disburse $100 billion or some fraction of that amount, what is much more important is whether and how effectively the Fund can be managed in terms of institutional transparency, accountability, and impact. Investing in Global Climate Solutions by Jacob Park is licensed under a Creative Commons Attribution-NonCommercial-ShareAlike 3.0 Unported License. The Green Climate Fund seems like an obvious and necessary mechanism, but I am just wondering given the size of the global economy and the financial impacts of natural disasters, if even it will make a dent for decades. One parallel I draw is that of ODA which garners so much attention but even at $200 billion dollars/year is less than a quarter of what was used to bail out banks in a single go in the US. In other words it is a lot of money, but relatively speaking to what goes on in the financial industry, it is a small amount of money when spread over more than 100 recipient countries right? But I guess it has to start small at first to be managed well (a challenge in itself as Dr Park aptly points out). In the present climate is there really anyone out there who can manage finances transparently anyway? Your post reminds of an old Woody Allen joke that goes something like this, “two New York city women are eating at a restaurant and one woman says, the ‘food in this restaurant is terrible!’ and the other woman replies, ‘I agree and in such short portions!”. when we eat at a restaurant, but the real issue/question is can you get all three things at the same time. It will take enormous financial investments to tackle global climate change, but before we start talk about a Green Climate Fund that is capable of disbursing $200 billion or even $1 billion a year , let’s make sure that we have the right/appropriate institutional vehicle to administer such funds, and the type of global best practices in transparency, accountability and impact that we should expect in any public sector programs. The political rhetoric of “you have caused the problem, now you need to help pay for it” may get you a nice applause line, but it will not you raise one Euro, $, or yen without the kinds of safeguards that are discussed in this article. The north has emitted most greenhouse gas emissions, and its actions so far show it prioritizes reducing emissions over helping poorer countries prepare and adapt to climate change. Meanwhile, the debate on climate finance lacks coherency on how funds will be mobilized to meet adaptation costs for vulnerable developing countries, in spite of plenty of nice words such as “leveraging private finance.” It’s now my aim to provide a constructive, concrete solution. Carbon markets, while imperfect, have been pretty successful in stimulating the private sector to identify, develop, and finance projects that reduce emissions in developing countries. Sure, not enough has been done in Africa, but solutions are being implemented “suppressed demand” for one thing, to ensure that emission reducing projects are supported in the poorest countries. Part of the problem with carbon projects in poor countries is that emissions are low to begin with, so the “market” in emission reduction is small and projects very small scale. Developing countries are where most people are the most vulnerable to climate change. As such, and unlike emission reducing projects, vulnerability reduction should be a large “market” in these countries. To be sure, the exposed asset value in financial terms is lower as assets are lower, but from the perspective of aggregate human needs: shelter, food security, health, etc., they are much greater. If the value of these fundamental needs is accounted for in a like-for-like manner with values in countries where these needs are largely met, then the potential value involved in reducing vulnerability to climate change is enormous – much higher in fact than the enormous costs experts believe are entailed in either accounting for the economic impact of climate change in developing countries, or paying for adaptation measures.